The wait is over in Plainview. Local residents, professionals and students no longer need to struggle with eating healthy when out and about. Vitality Bowls, which specializes in açaí bowls – a thick blend of the Amazon’s antioxidant-rich açaí berry, topped with a variety of superfoods – announced today the opening of its café in Plainview. The new franchise location will be the first for Denise and Charlie Scuderi, who plan to open additional cafés in the Nassau County area. Slated to open on March 28, the new restaurant is located at 52 Mannetto Hill Road conveniently situated in the Fairway Shopping Center. This restaurant will be the third Vitality Bowls café in New York, joining the 100 locations open or in development nationwide. Originating in Northern California, Vitality Bowls has solidified itself as America’s superfood café – combining a dynamic café vibe with a unique collection of menu items containing high nutritional values and extraordinary tastes. 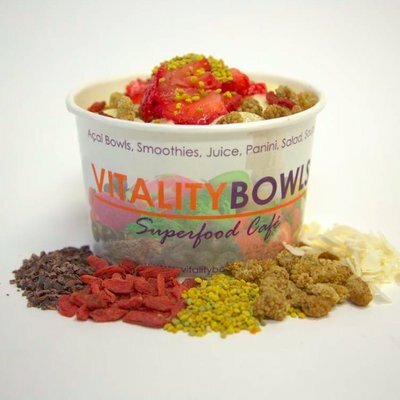 Vitality Bowls offers an antioxidant-rich menu, with breakfast, lunch and dinner items made to order for each customer. All açaí bowls and smoothies do not contain ingredient fillers such as ice, frozen yogurt, added sugar or artificial preservatives, giving the purest taste possible. The menu features the widest variety of unique superfoods, including graviola, acerola, mangosteen, camu camu, spirulina, aronia, moringa, maca, bee pollen and more. Guests can choose from a variety of delectable options, such as the Green Bowl (with organic graviola, spirulina and hemp seeds), the Dragon Bowl (featuring organic pitaya, coconut milk and bananas) and their signature Vitality Bowl (with organic açaí, strawberries and honey). Plus, fresh juices, smoothies, soups, panini and salads are available in each café. The eatery will also include a full-service coffee bar, complete with espresso and superfood drinks that are packed with antioxidant-rich açaí, pitaya and matcha – for example, the Açaí Latte (espresso, açaí, coconut sugar, steamed almond milk) or the Superfood Mocha (espresso, CaCoCo superfood chocolate blend, steamed milk). Organic cold brew nitrogen-poured coffee and organic kombucha will also be available on-tap. Since launching in 2011, the brand has ignited significant growth. In 2014, the concept began franchising and now has more than 100 locations open or in development across the country.